The Securities and Exchange Commission (SEC) lawsuit against Tesla CEO Elon Musk for “false and misleading” statements has been settled. Musk and Tesla will pay $20 million each, and the visionary leader will step down as chairman of the Board for at least 3 years but retain his position as Chief Executive Officer (CEO). Where does that leave Tesla? And how will the legal scrutiny of Tesla affect the future innovation of this company, known for a confluence of electric vehicles, lithium-ion battery energy storage, and solar panel + battery manufacturing? What was so special about “tomorrow?” September 29 was much more than the last day of the month. It was the end of Q3, and that was the quarter toward which supporters, skeptics, and Musk himself were looking for the first glimpse of sustainable company profitability, largely due to delivering Model 3 in volume and at a sufficient growth margin. “Our goal is to be profitable and cash flow positive for every quarter going forward,” Musk forecast on an August 1, 2018 earnings call. As we know now, Tesla saw strong deliveries in Q3 that more than doubled Q2’s record deliveries. They beat Wall Street expectations and imply a strong financial finish, possibly delivering a net quarterly profit. Tesla, valued somewhere around $50 billion on the stock market, has obtained a relatively exponential production ramp with its Model 3. The company deployed a significant amount of automation in building the new vehicle, and, as production scales up, cost absorption should increase Model 3 gross margins to about 25% by next year if the company’s targets are reached, which is comparable to other premium vehicles and high in the automotive world overall. Why is a profitable Q3 integral to Tesla’s future innovation? Does a commitment to corporate innovation actually pay off? Growing companies need ideas, and companies that generate lots of good ideas tend to have profitable growth. But it’s untenable to suggest that simply incentivizing workers has increased the ideation rate and fostered profitability at Tesla. Tesla has shown over and over again that healthy ideation and income growth are a result of a culture of innovation. Each of Musk’s companies, including SolarCity, which is now part of Tesla, has achieved more than most ever do. He envisioned reducing the cost of batteries for electric cars, selling millions of rooftop solar systems, introducing an all-electric car company that creates the best cars (of any type) in the world, and more. The evolution from Tesla’s original Roadster up through its planned reincarnation point to Tesla’s ability to test, learn, and improve. Profitability at Tesla is a delicate melange of originality and production directed to future innovation. The loyal Tesla customer base wants better, faster, smarter products with increased capabilities (see: Easter eggs). They also want innovative products continuously emerging without production delays — hence the focus on Q3 profitability and assurances that Model 3 production automation is now glitch free and achieving stability on measurable metrics. Of course, with each remarkable Tesla innovation comes a shifting risk landscape. Musk very effectively manages innovation-related risks and the outcomes required in an era of digital transformation. That’s due in part to his gifts as an intellectual but also his tenacity — for example, sleeping in the factory beside the production line. Spurring on a cleantech industry that soars along a trajectory of rapid evolution, Musk has compressed the time between major Tesla change events. His business model for converting ideas and technologies into economic value anticipates dramatic shifts in the cleantech markets, often in response to a perceived need for which only Musk can envision a pragmatic road map to implementation. As Musk sets the Tesla company course for future innovation, he articulates value propositions for users, identifying the market segment for the product and the structure of the value chain to get the product to the consumer. Okay, he’s a little avante garde in estimating the cost structure and the revenue potential, but what visionary isn’t? He totally recognizes the position of Tesla innovation within a broader ecosystem and formulates a competitive strategy by which the future innovation will gain foothold and advantage over any possible competitors. Musk is that rare CEO who can integrate his company’s innovation process with the Tesla company business model, constantly advancing Tesla’s allure and impact on the marketplace. Innovation challenges generate actionable ideas, and those ideas, when allowed to bloom, often generate profitable growth. As a result, even naysayers like those at Seeking Alpha are projecting a profitable Q3 for Tesla. Higher growth, future innovation, and profitability are a cycle that feed and nurture each other behind Tesla’s doors. Elon Musk is a visionary CEO, and, yes, some of his own decisions have brought the company headaches. For example, as investors absorbed the gravity of the SEC case against Musk, shares of Tesla dropped by nearly 14% by the close of trading on Friday, September 28, 2018. If the downward Tesla stock trend had continued, future innovation in cleantech would have experienced immense harm. Tesla is a harbinger of what might be in future innovation, and we need Elon Musk’s vision to continue to propel us to a sustainable tomorrow. Sure, Musk will need to confront cultural, strategic, political, and budget issues if he wants to ensure that Tesla’s audiences embrace new ideas. 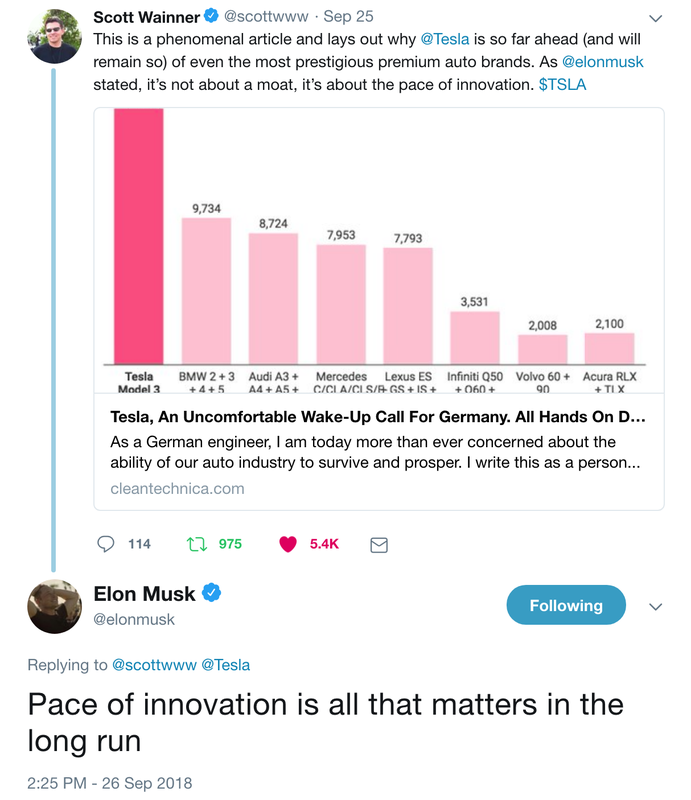 The US green economy needs more Musk and more people like him to make the US innovative, forward-thinking, and revolutionary again. Musk has acted upon his dreams, accomplishing already what many people consider to be impossible. His leadership entices people to believe that what seemed impossible could actually happen in a dream-come-true fashion. He applies the laws of physics to contemporary quandaries and sees solutions that others do not. The cult of investors behind Musk have swallowed more than once when the proverbial light bulb snaps on in his head, knowing that with Tesla, high risk also brings the potential for high reward. The SEC brought the case against Musk with full knowledge that they would be seeking to undermine a chief executive with a big fan base and a reputation for groundbreaking entrepreneurship. Instead of breaking the innovative back that is the core of Tesla, the settlement will likely only motivate Musk to achieve even greater heights of cleantech accomplishments.